Once I learned that coaching volleyball skills would help me become a better player I began teaching the game whenever I could. I've always been a student of the game. 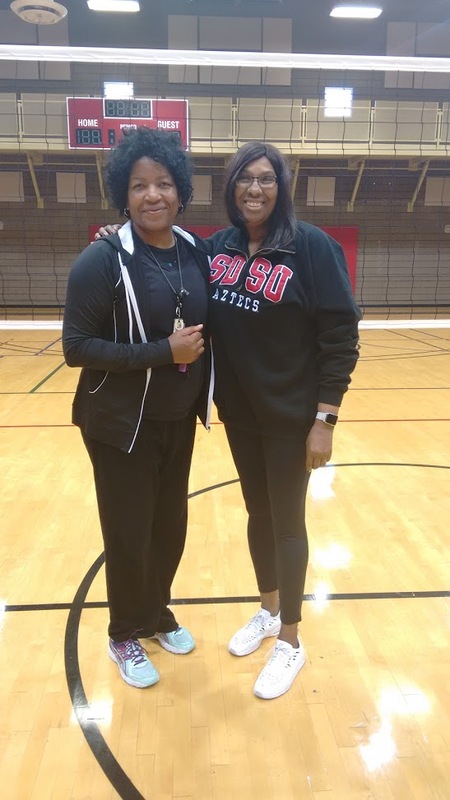 Coach April with Head coach at San Diego State University Deitre Collins. 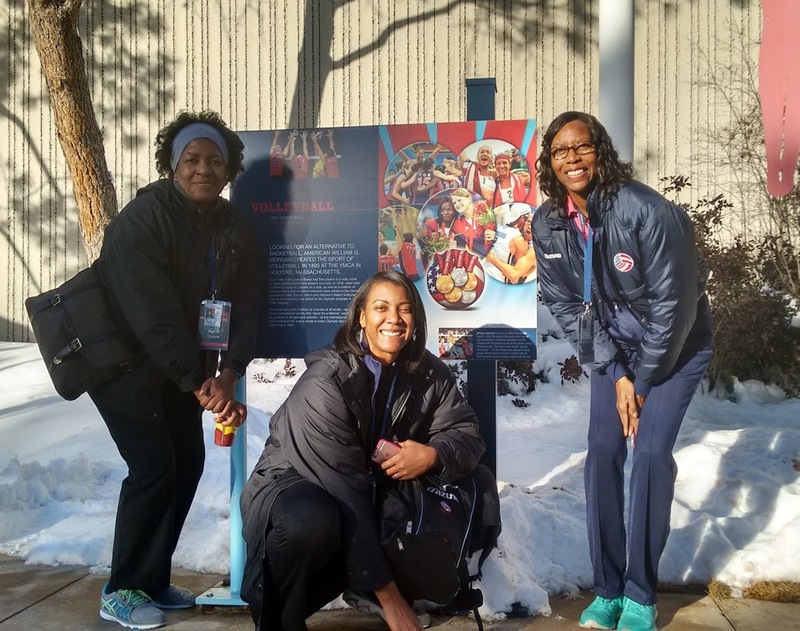 I've been fortunate enough from the very beginning of my career to be surrounded by professors and graduates of the sport so learning the best way to play, and the best way to win helped form how I learned the best ways to coach volleyball skills to others. 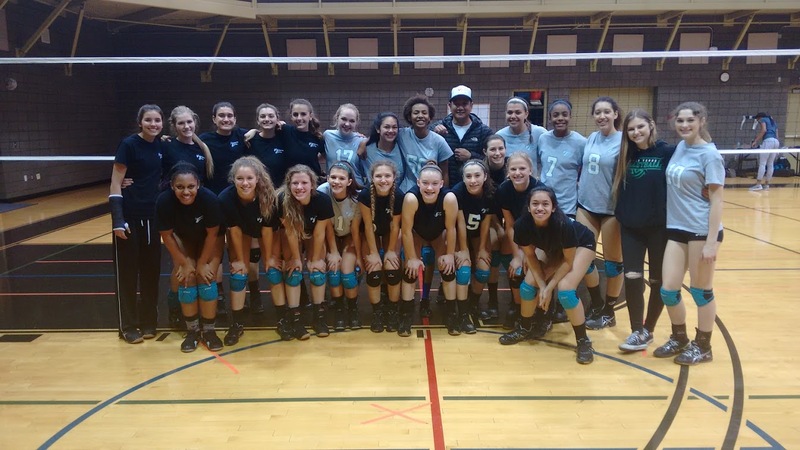 Starting from when I was just beginning high school and attended USVBA club practices with the Sato family to.. .
USA Volleyball Olympic gold and bronze medalist Eric Sato, my first pepper partner ever, comes to visit my Volleycats elite club teams at Stupak Community Center. 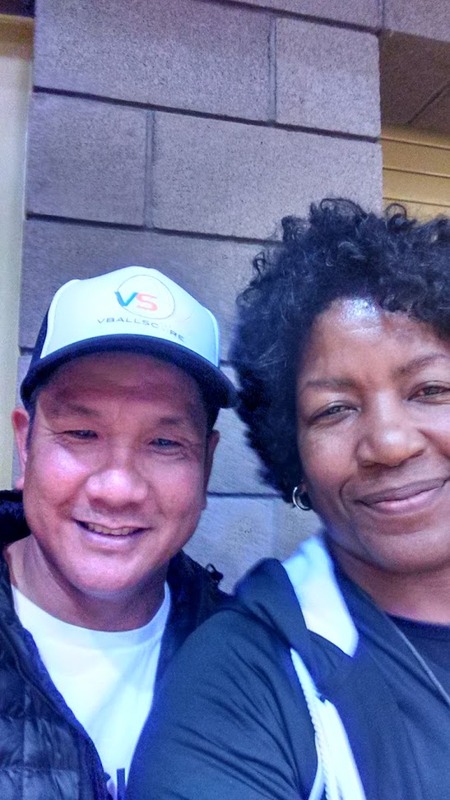 (youngest Sato, two-time Olympic gold medalist Eric was my first pepper partner) ...when I found myself on the same team as three-time Olympian Paula Weishoff in Italy and our team was led by a young unknown coach who up to that point had only coached in lower level Serie B..
Olympic gold and bronze medalist Eric Sato, my first pepper partner ever, poses with the Volleycats Elite Club teams at Stupak Community Center. We ended up in the finals of the Italian championships, the finals of the Cup of Cups championships (Coppa delle Coppe) and the finals of the Italian Cup. At that level of play, its the best of the best...Olympians and national team members playing against each other on the foreign pro teams they were paid to play for. I was one of those professional players, for a very long time. This sport has taken me to almost all the fifty states and to many many places all over the world. I've been lucky to watch up close, photograph, talk to and be coached by some of the greatest coaches in the sport and play with or against some of the best players to EVER play the game. Its been fun to learn the game, and learn how to compete and win...at the highest levels of competition. At this point in my life, I have a really good time sharing my knowledge with younger players. 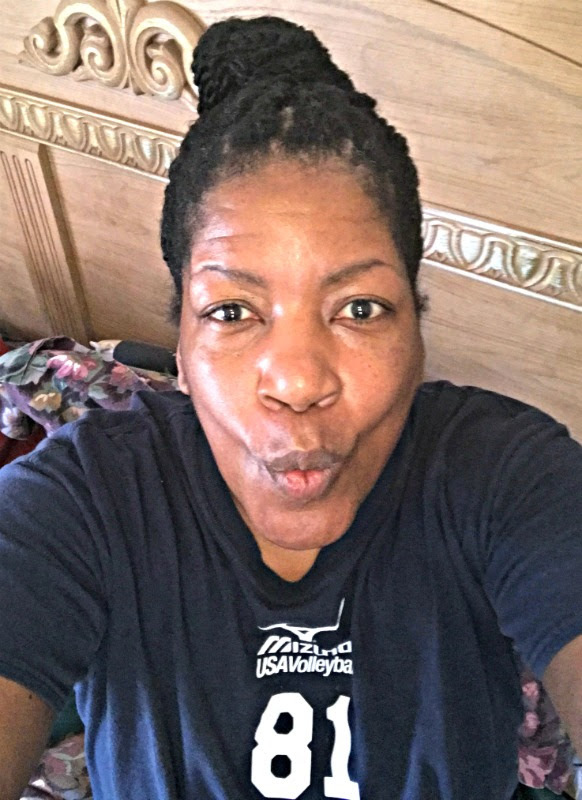 From those that are here in Las Vegas to the USA Volleyball High Performance kids I get to be involved with every summer, to kids who come to my Volleyball Voice Boot Camp classes and clinics to those I coach and train privately. ...let's get started! 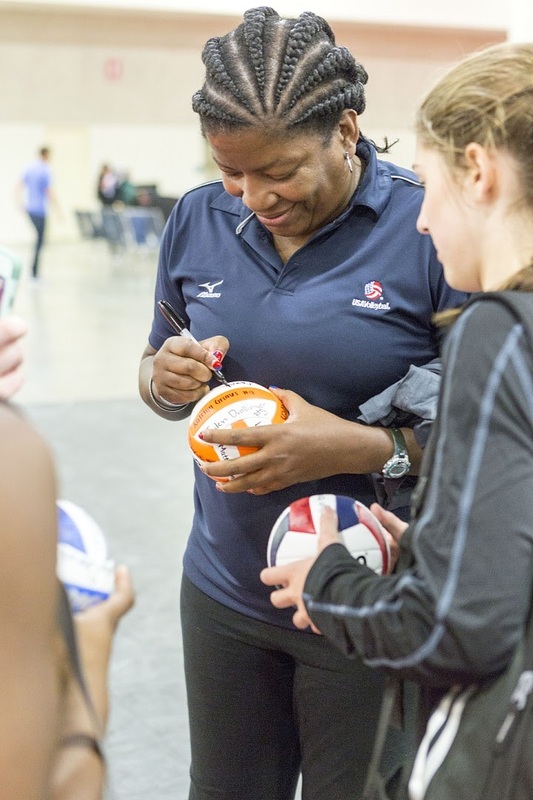 You came here to improve your volleyball skills so let me tell you about some important things you'll find here on my site that will help you do just that. I love to coach serving in volleyball. There's a reason. I loved scoring points with my serves when I played. It saved time and effort, don't laugh! If you don't HAVE to play defense, then why do it! As a player, once I was told that serving was the first opportunity a player had to score a point for their team, that's when I started spending a ton of time working on my serving skills. 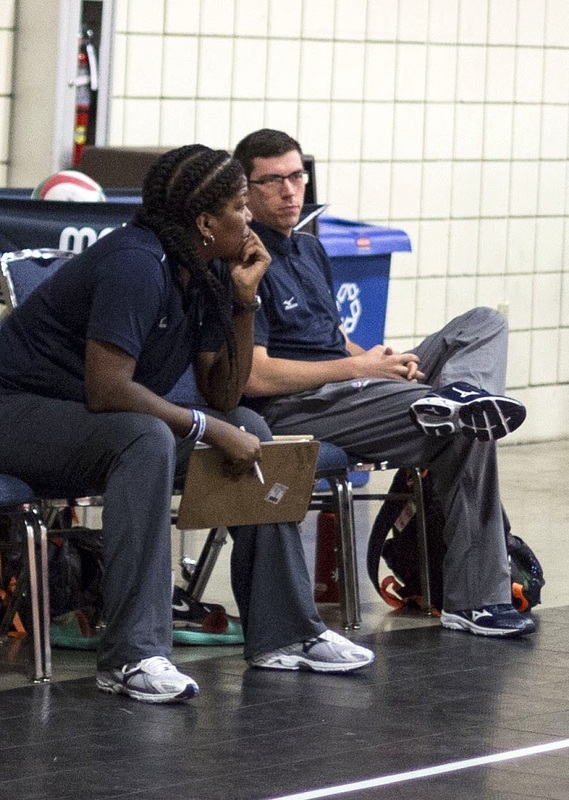 Coach April Chapple, coaching volleyball skills at the USA High Performance Volleyball Championships, Fort Lauderdale, FL 2016. Could there have been a little ego involved? The serve is an opportunity for a player to go back to the service line and literally win the game from there. If you can serve 15 balls in a row or 25 whatever you are playing to..by the rules of the game, one player could win the game for their team! So I thought, Okay, why not try that every time I went back to serve? Does it happen, yes it does. I've been on the court when someone (okay not someone...Olympian Mary Jo Peppler) has served 14 balls in a row when we were down 3-14, so yes it can be done. 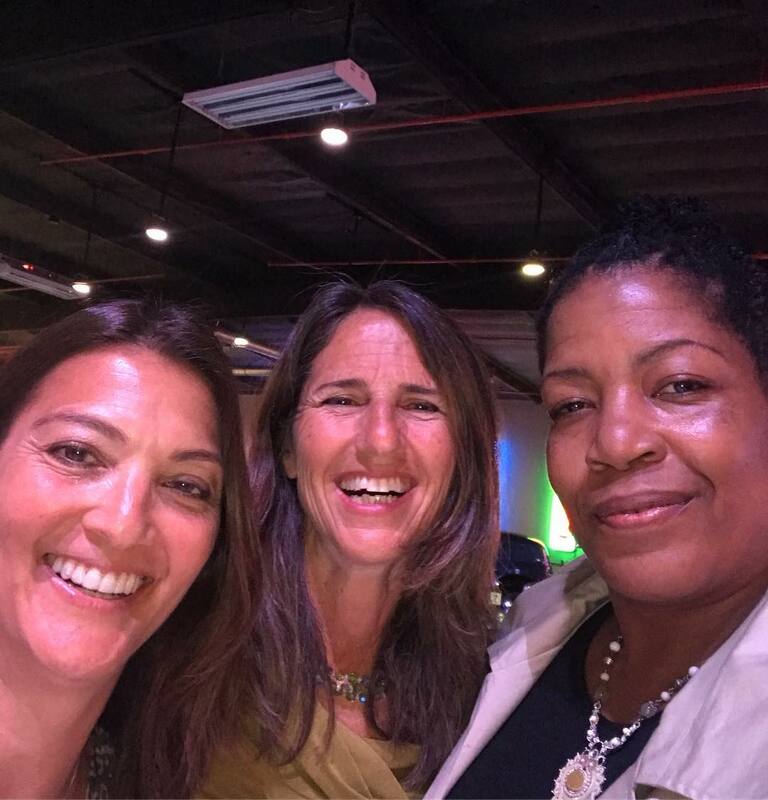 Olympian and SoCal indoor VB inductee, Liz Masakayan,with UCLA and National team teammate Merja Connolly and my World University game teammates. Serving the ball is the one skill in volleyball where a player can score a point all by themselves. So why not try? At least, your goal should be to become that player who can be counted upon to consistently score a series of points from the service line. That's how tough the serve you want to develop should become and that's how dependable you want to be for your team. A point scoring machine from the end line every time you go back to serve the ball. Debbie and I played in the Major League Volleyball. 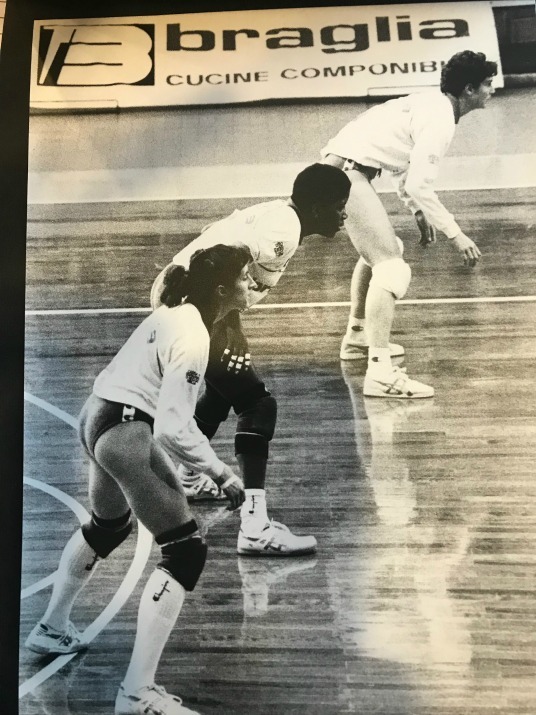 Debbie was on LA Starlites and I was on the New York Liberties the first time a pro womens league for indoor volleyball was established in the US. Players who are non-setters should regularly work on setting technique getting regular reps with a partner or against the wall. They should also remember to develop arm strength so they can practice setting long distances. Former teammate, indoor Olympian, Beach Volleyball champion and two-time US Olympic Beach Volleyball coach Liz Masakayan visits Stupak Community Center to talk to my Volleycats Elite club teams. In other words, work on the ability to set the ball long distances away, from antenna to antenna or from one side of the court to the other so that, when that moment comes, you know THAT moment...when your setter is running for a ball and she twists her ankle. And there's no one else to set the ball on your team. Well, in your case, there actually is someone, right? Someone who's capable of setting the ball to the outside hitter because they practiced it already. How about if that someone were you? When coaching volleyball skills we do many types of setting drills for accuracy, to build strength and for consistency. 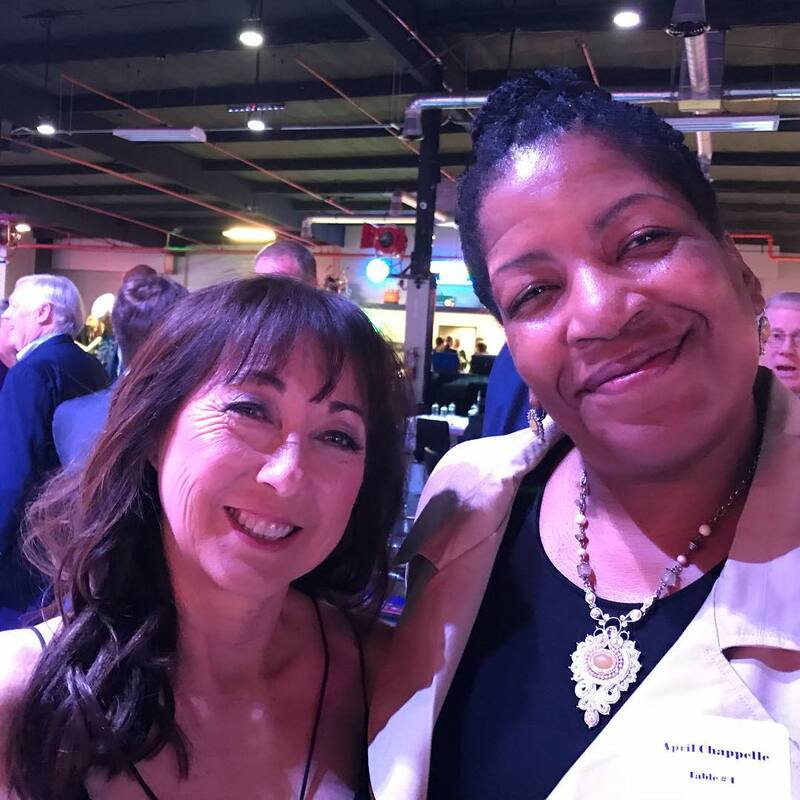 Elaina Oden, legendary middle blocker for the 1988 Olympic bronze medalists Women's USA Volleyball team at the Southern California Indoor Volleyball Hall of Fame Induction. 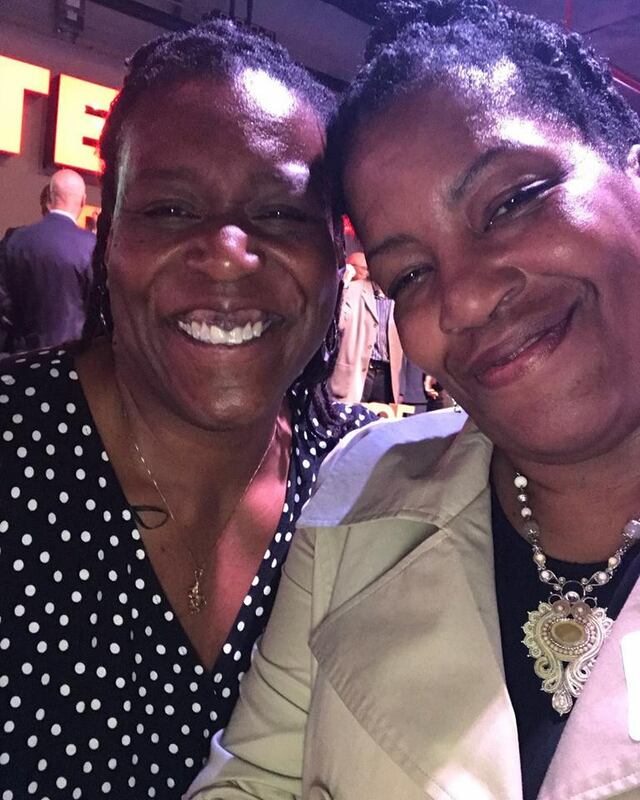 Former teammate, middle blocking legendary middle Oden sister, Elaina Oden and I together were professional women's players for the Fulgor Fidenza team in Italy. Doesn't matter! You can still contribute as a front row defender which is basically what a blocker is. Learning how to block a volleyball is important because that wall that you put up with your hands is the first line of defense your team has to try and keep the ball on your opponent's side of the court, once your team has served the ball. There are two skills you must conquer if you are going to even think about playing competitive volleyball, the first is serving, the second is passing. I'll make this easy, if you can't pass, you can't play. Passing the ball is a technical skill that can take a minute to learn but you need to keep doing consistent reps to stay sharp. 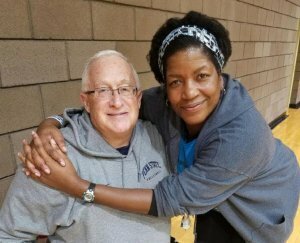 Whether against the wall at first and then live passing on the court, which is what we do at Stupak Community Center, you can train yourself to get better. Man, I love defense. I love digging. Actually I had to learn to love to dig because I'm six feet tall and have been since high school. 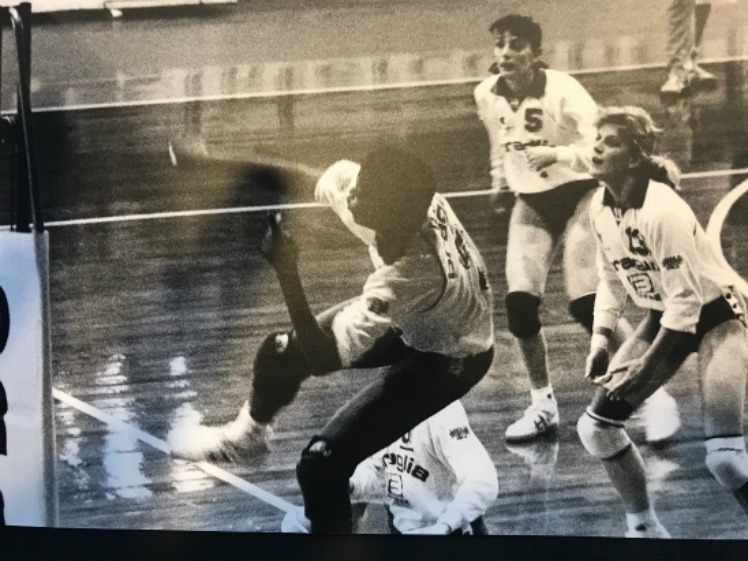 It wasn't until college when I played at the University of Tennessee, Knoxville under Bob Bertucci and trained also with seven-time NCAA champion Penn State head coach Russ Rose that I learned how to enjoy playing defense as a tall player in the back row. Regardless of your height, you can learn to dig, and learn to chase balls and you can learn to love it! When you and your five players are on the defensive side, you need to block the ball which keeps the ball from crossing the net back into your court, and if the ball does get past the block, then someone on your team has to dig a ball. Of course I save the best for last. Because what every future Olympian player wants to learn is how to spike a volleyball, right? That's the most common question I get. How can I spike like a pro player? When can we hit? Well you can't think about hitting until you get the ball over the net and then pass it or receive serve. So there's that. Then... your setter has to get to the second ball so she can set you. So basically three other skills have to be done correctly before you can even begin to think about approaching the spike technique. But eventually we do. We always get to spiking the ball.